Recently I'm doing yet another migration between Office 365 tenants using Bittitan Migration Wizard. It's a great tool and takes away a lot of headaches when dealing with the migration of mailboxes or OneDrive data. Unfortunately, like with many blogs on my website I had to hit yet another error. This time error occurred when I tried to assign User Migration Bundle license to users on the Migration Wizard. The weird thing is I didn't do anything out of ordinary. I've been adding users the same way I always do and never had this error before. 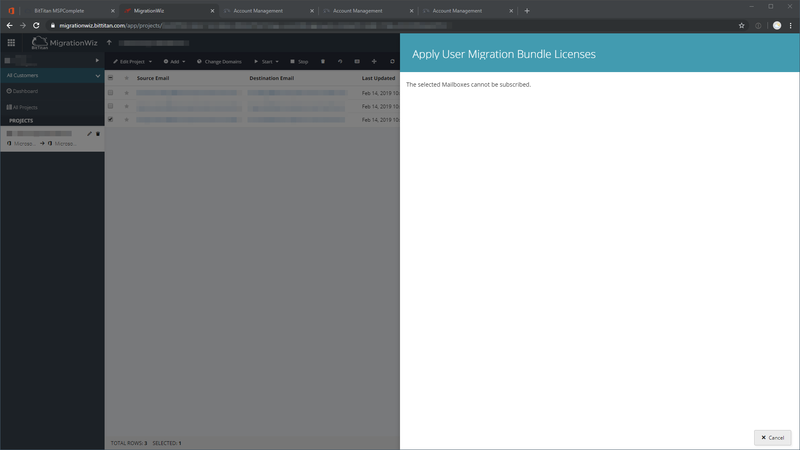 When you are adding users in Migration Wizard, it synchronizes licenses between this tool and MSP Complete part of Bittitan (User Migration Bundle can be used for multiple migrations). Sometimes this synchronization fails, and the error occurs. The solution to this is quite simple. Delete user, and add the user back but from MSP Complete section. While adding the user back from MigrationWiz could work I tried multiple times, and it failed. Adding user from MSP Complete section and importing to MigrationWiz resolved my issue. It seems the process is more robust this way and is recommended by Bittitan.